This is my sisters sloppy joe recipe. It is the best ever I believe. I've made X 10 batches of this and it is just as good. It works well in a crock pot as long as you brown and drain the excess fat of the ground beef and sausage. In large roasting pan brown ground beef and sausage together. After brown, remove from heat and drain off all fat. Return to pan and add green peppers, tomato sauce, water, ketchup, brown sugar, cider vinegar, mustard, chili powder, Worcestershire sauce and salt. 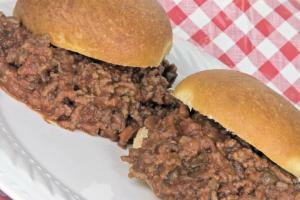 Mix all ingredients together until mixed thoroughly and cook slowly until mixture is thickened slightly and Sloppy Joe is smooth breaking up any chunks with a wire whisk if necessary. When mixture is slightly thickened sift flour over Sloppy Joe mixture a little at a time mixing in while you sift so you don�t get flour lumps in the Joe. Serve at once. (Note: take out what you will need for service and heat up that amount. Sloppy Joe will last a week in the cooler. It also freezes well in the proper container).